← Have your written your good-bye letter? #Parents take heed, this Word Press Prompt Truth or dare prompt asks if honesty always the best policy? My answer? Almost always. Lying is a fact of life. Kids learn to lie long before reaching their teens. Moreover, almost all teens belong to the Liars Club. Most likely so do you, certainly the majority of advertisers, most other people trying to sell something, the media, and 99.9% of all politicians lie. I hate lies, but know even just by keeping quiet about some things I lie lots. Moreover, there are kind lies, honorable lies, mean lies, and cruel lies. When I lie it is usually to protect someone else’s feelings. Nevertheless, I hate lies and try to avoid telling even the kinder ones. Is it really kind to tell someone a dress looks good when it does not? Lies are viruses which might do no harm sometimes, but also can spread like a cancer and destroy much that is good, particularly in relationships. Tip one: Until children can read, they are not always clear on the difference between wishes and reality. Don’t expect or worry about lies for the very young. If you know it is a lie, label it as imagination or a wish. These are the steps needed to lay the ground work for sorting out the real versus the not so real. You can also label cartoons, the puppets on most children’s shows as not real, but fun imaginings. Tip two: Once you know your child can tell the difference between real and imaginary, make the importance of being honest the topic of a family meeting. Don’t have family meetings? Start having them now. Get a jump starts by reading my eBook How to Hold a Successful Family Meeting. Costs less than a fancy latte and is better for your family. Meanwhile. end of that commercial and back to lie prevention. Tip three: Remember as Mark Twain said, “There are lies, damned lies and statisics.” Rating is an Emotional Fitness Exercise so you can focus on what matters. Given the prevalence of lying, outlawing lies won’t work. Better to teach the difference between white lies, harmful lies, and damned lies. Tip four: Label lies that you know are lies, including your own. Tip six: Another commercial. 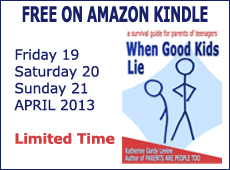 My eBook When Good Kids Lie is full of more information about how to handle lying. Really worried? Buy it now for 99 cents. Not so worried or a bit broke? Get it free this this Friday, Saturday, and Sunday. A PLEA FOR HELP: Help me share my knowledge. Like, comment, share, endorse, write a review if you buy or get one of my eBooks free. Reviews are particularly helpful. Here is a link a blow post I wrote about how to write reveiws. Why I hope you will help: My parent advice combines two streams of knowledge most other “experts” have not experienced. The first: life as a foster parent housing youth in trouble with the law. My husband and I offered short term care to nearly 400 while the courts decided their fates. We were called a non-secure detention home. Most of our kids were good kids, others were criminals – burglers, theives, rapists, an arsonist. Most of these eventually ended up in prison as adults. The second.I am also a trained clinician and licensed therapist. For over ten years I directed the Visiting Nurse Service of New York’s mental health mobile crisis teams throughout the poverty ridden South Bronx. I trained New York City’s crisis teams as a consultant. I taught graduate level courses at the Columbia Universisty School of Social Work for over twenty years. All of the above to say I combine practical and clinical knowledge as no other parent adviser can or does. I also know my advice is only true for some, some of the time. You have to pick and choose from all advice, which is why I try to provide lots and lots of tips and choices. Parents have two jobs: To teach right from wrong and to preserve a caring relationship with their child. Lying threatens important relationships. DISCLAIMER TWO: FORGIVE MY GRAMMATICAL ERRORS FOR I HAVE DYSGRAPHIA. If you need perfect posts, you will not find them here. Dysgraphia is a not well-known learning disability and means that sometimes my sentence structure is not that easy to follow or I make other errors. Still, most people understand me. All of my books are professionally edited, but not all of my blog posts are. If this troubles you, feel free to read elsewhere. If you persevere, you are practicing kindness by lifting my spirits for that means you find what I say helpful and that is one of my missions. Kindness always repays those who spread it. This entry was posted in Parenting Issues and tagged challenging children, parenting, parenting teenagers, parenting tips, parents, postaday, quotes, Self-care, teaching honesty, The Liars Club, tips on parenting, When Good Kids Do Bad Things. Bookmark the permalink.